Of course, the Christian hope lies not in “righteous human society” or the “social order” or of anything of this present world. “Most people understand hope as wishful thinking, as in “I hope something will happen.” This is not what the Bible means by hope. The biblical definition of hope is “confident expectation.” Hope is a firm assurance regarding things that are unclear and unknown (Romans 8:24-25; Hebrews 11:1, 7). Hope is a fundamental component of the life of the righteous (Proverbs 23:18). Without hope, life loses its meaning (Lamentations 3:18; Job 7:6) and in death there is no hope (Isaiah 38:18; Job 17:15). The righteous who trust or put their hope in God will be helped (Psalm 28:7), and they will not be confounded, put to shame, or disappointed (Isaiah 49:23). The righteous, who have this trustful hope in God, have a general confidence in God’s protection and help (Jeremiah 29:11) and are free from fear and anxiety (Psalm 46:2-3). Everything that takes time from the preaching of the gospel of Jesus Christ–whether it is “a new vision,” a “great task” or any other man-concocted scheme–is a distraction from the Great Commission. This NWO book was linked to remind believers that despite the best-laid plans of man; regardless of the decades-old machinations of the enemy: nothing can separate us from the love of Christ. Believers do not need man-authored books to know that persecution and tribulation is soon to come: it’s all laid out clearly enough in the Bible. However, believers should see in this coming persecution great hope–and should need nothing more than the assurances given in God’s Word of eternal deliverance. 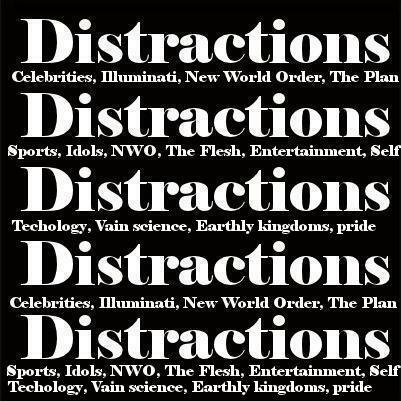 Believers: Do not be distracted. Keep your eyes on Christ.